The Green Bay Packers Middle South End Zone is a comprised of sections on the 600 level over the south end zone at Lambeau Field. The Lambeau Field seating chart shows the Middle South End Zone between the Lower South End Zone on the 400 level and the Upper South End Zone on the 700 level. Green Bay Packers Middle South End Zone seats are divided into 17 sections above the south end zone: section 630S, section 632S, section 634S, section 635S, section 636S, section 637S, section 638S, section 639S, section 640S, section 641S, section 642S, section 643S, section 644S, section 645S, section 646S, section 647S, and section 648S. Seats throughout the Middle South End Zone offer an affordable way to get a mediocre view of the game. The end zone view is obviously far worse than sitting near midfield and the height of the 600 level makes it difficult to identify individual players on the turf. But the seating area itself is a fun space partially-separated from the rest of the stadium. Restrooms, concourses, and walkways are less crowded than in the main part of the seating bowl and fans who are looking for a good time at a Packers game should at least consider tickets to the Middle South End Zone. Packers Middle South End Zone tickets are sold as season-long tickets to fans who have been long-time season ticket holders. 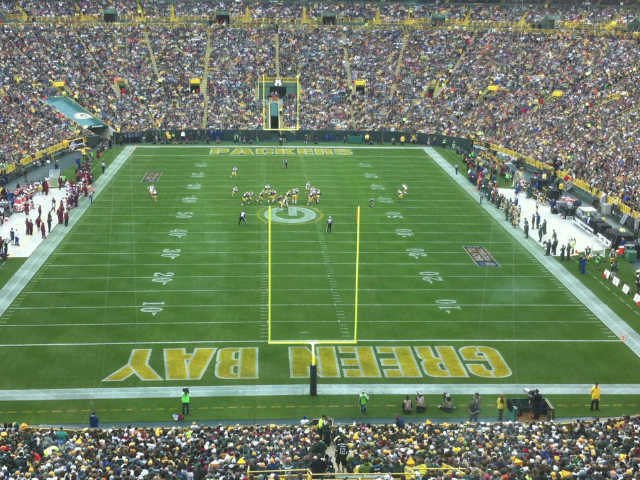 With high demand for Packers tickets, no single game tickets for the seating area are sold by the team. Fans who want to attend a single game in the Middle South End Zone should look to ticket brokers and independent ticket agents for available inventory. Prices vary with game and opposition, but preseason games are generally sold for below face value while regular season games cost more than face value.